£75 non refundable deposit to be paid at the time of booking by bank transfer or cheque. Balance due 4 weeks before arrival. If paying by cheque this must be received and cleared 4 weeks before arrival. 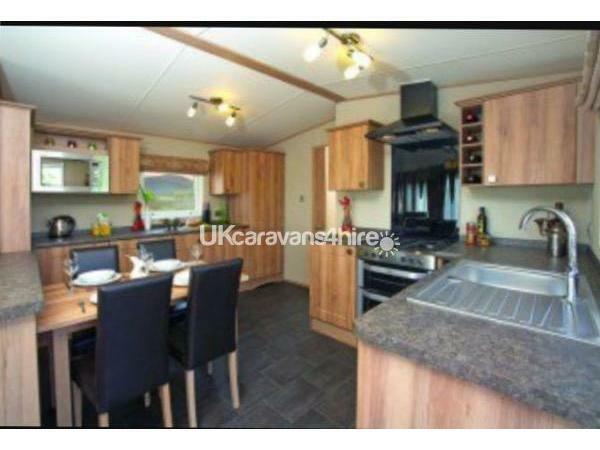 This is a strictly no smoking caravan which includes the front and side deckings. We are non smokers as are the majority of our guests. Check in is 4pm and we ask you vacate the caravan by 10am on the day of departure. We do not charge a house keeping bond as have not had to. 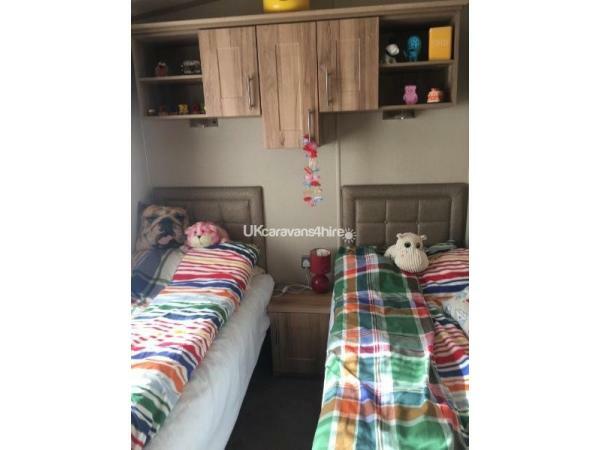 We want to stay that way and would ask that the caravan is left as clean and tidy as you find it. Any breakages must be replaced and reported immediately. Should a breakage be noticed after departure we will look to you for the cost of any damaged items. 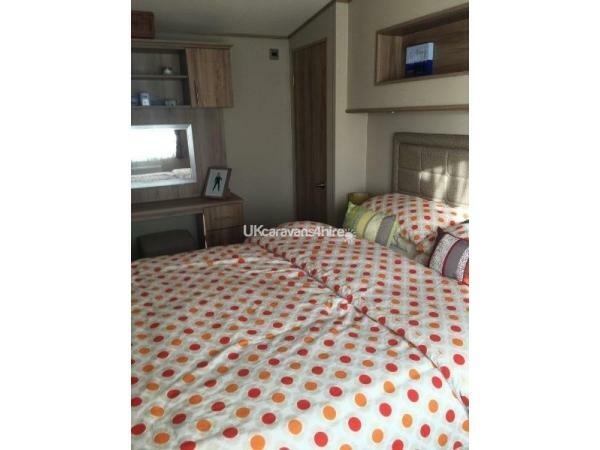 WOW FACTOR PRIVATELY OWNED, CARAVAN AND OWNER MAINTAINED. The main living area consists of large openplan kitchen, dining and living room area with plenty of units, breakfast bar and has the benefit of integrated dishwasher, washing machine and large fridge freezer. The lounge area consists of large free standing sofa (which easily pulls out to make a double bed), chair, footstall and coffee table. Double patio doors lead to a decked area. 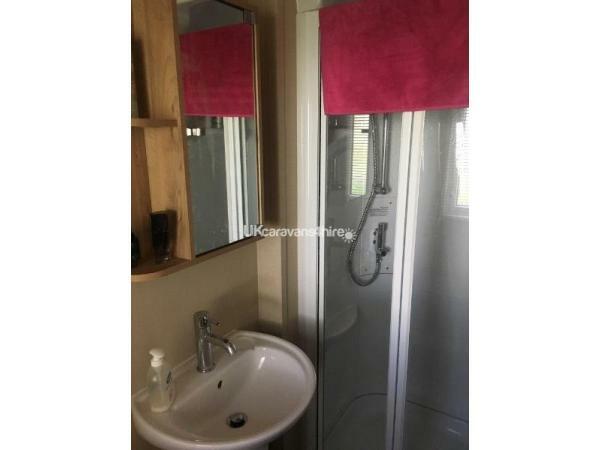 The family bathroom has a double shower, built in vanity unit and toilet and hidden boiler cupboard. From the kitchen door access is gained to the large side decking with table and chairs and plenty of room for sunbathing and relaxing. Steps lead down to a grass area and rotary washing line and car parking space. 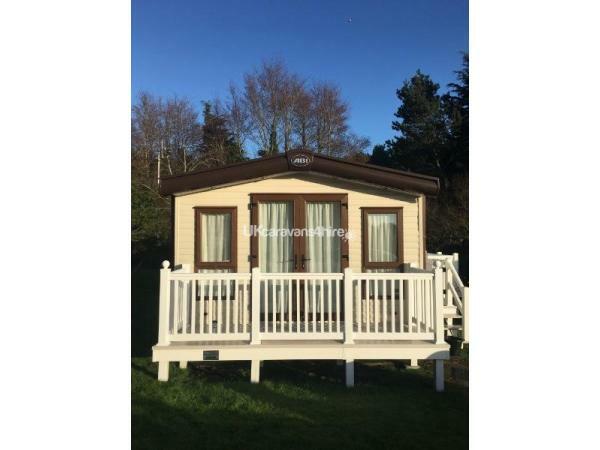 To the front of the caravan is a small decked area perfect for enjoying a morning coffee. Additional Info: The park is a medium size with plenty of children's play areas, 3 heated outdoor swimming pools, soft play area, arcade, bar,restaurant and nightly entertainment. 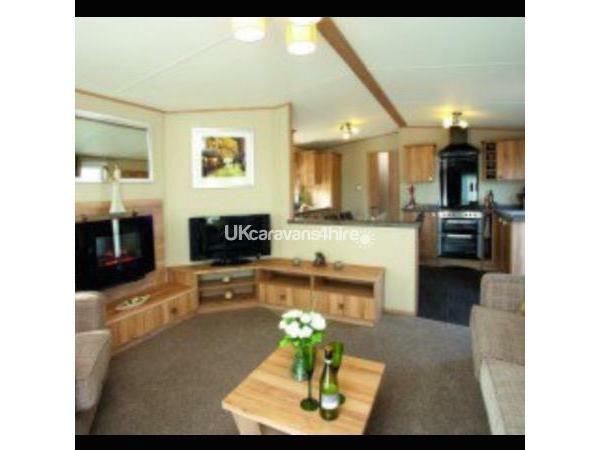 I would definitely recommend this caravan. It was lovely inside and out. 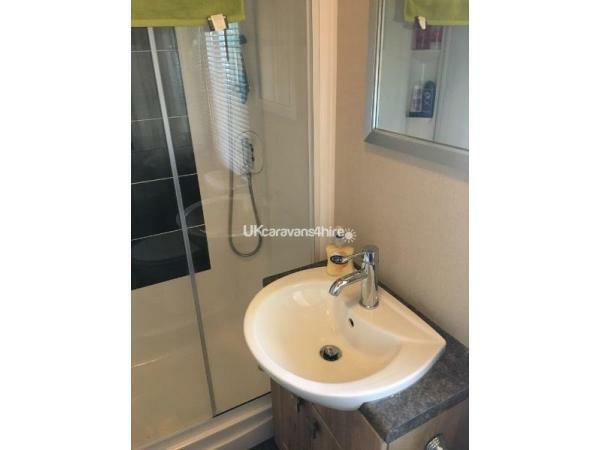 It was clean and the ensuite was huge with a built in shower which was also in the main bathroom too. There was also plenty of room to store our clothes with the walk-in-wardrobe that was in the main bedroom. The fridge freezer was huge too and the kitchen also included a dishwasher and washing machine. Most of all the owner was quick to reply to my e-mail messages I sent out and answered any queries I had without hesitation. Thank you for your lovely comments. Glad you enjoyed your stay.